It has been a fantastic year for our Play Overseas students and we could not be prouder of all of their achievements. All of our athletes have excelled both academically and athletically, winning league titles and national championships along the way. 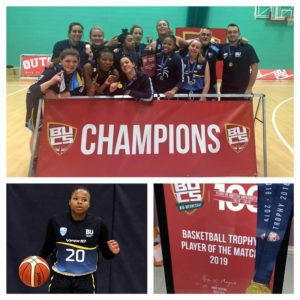 Former Mount Mercy Mustang, Zemoria Jernigan has ended her basketball season on a high by winning the Women’s National Championship with Bournemouth University. Zemoria arrived in the U.K. in fall of 2018 to pursue her masters degree in Investigative Forensic Psychology and continue her basketball career after a fantastic senior season at Mount Mercy University. After finishing the regular season undefeated and winning the Western 1A League Title, Zemoria led her team to victory over the University of Nottingham to lift the BUCS cup and become a U.K. National Champion. An incredible performance from Zemoria in the BUCS Trophy Final earned her the BUCS Trophy MVP Award. Despite trailing 22-11 at the end of the first quarter, BU battled back to be trailing just 26-25 at the halfway point. Coming out strong in the second half, Bournemouth proved too strong for the University of Nottingham as they built a 28 point lead and closed out a 77-49 victory, claiming the BUCS Trophy. 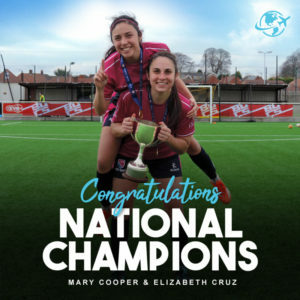 It has been a truly memorable year for Mary Cooper and Elizabeth Cruz of the Nottingham Trent Womens Soccer Team. After finishing the regular season undefeated and winning the league title, Nottingham Trent went on to lift the BUCS Trophy to become National Champions. Mary Cooper, a graduate of West Virginia Wesleyan College, has led the NTU defence as a centre back all season with her team conceding just 8 goals in 15 games and not suffering a single defeat. Elizabeth Cruz, the University of California Merced’s all-time women’s soccer assist leader led the attack as NTU scored an incredible 66 goals in just 15 games, averaging 4.4 goals per game. Nottingham Trent Women’s 1st team finished their entire regular season undefeated, winning all 10 games with standout victories against Oxford University (9-0) and the University of Birmingham 2nd (6-0) as they claimed the Midlands 1A league title. NTU went onto win their first ever BUCS Trophy with a convincing win against Bristol 1st and finished the tournament scoring an impressive 23 goals in just 5 games and only conceding 3. Follow in their footsteps and apply today! If you wish to follow in the footsteps of our athletes and explore what opportunities may be available to you in the U.K, all you need to do is complete the application form on our website.